Driv, the newly named, newly stitched-together combination of $6.4 billion worth of Tenneco and Federal-Mogul businesses, wants to grow in two directions at once. It believes it can entice additional automaker customers with its intelligent suspension systems. And on the aftermarket side, it envisions new opportunity from a jewelry box of automotive brand names — five of them, including Monroe and Champion, more than a century old. Last week, ahead of its official spinoff as a publicly traded company in the second half of the year, the entity formerly referred to only as "Spinco" rechristened itself as Driv, a company made up of 56 percent aftermarket sales and 44 percent original equipment business. 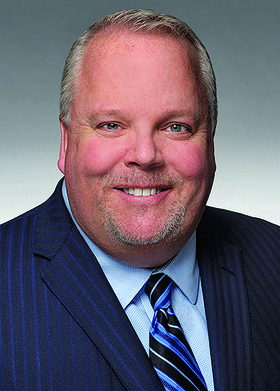 Brian Kesseler, formerly Tenneco CEO and now chief executive of Driv, told Automotive News the spinoff has a good shot at sharply increasing both activities in the coming years. But when it does, Kesseler said, the company's market split likely still will be around 56-44. "We like it this way," Kesseler said. "That's a good mix. "I spent the past 20 years on the aftermarket side," he said of his years with Tenneco and before that with Johnson Controls' battery business. "I know what the opportunities are. But I also started my career on the OE side. I know what it takes to succeed in OE. To do well there, you need to hone yourself to a razor's edge, operationally. "For us, doing that means we will bring that mentality to the aftermarket to make ourselves better there, too." The powertrain and emissions technologies of the Tenneco and Federal-Mogul union will remain with Tenneco and continue under the Tenneco name. That part of the merged operations will be a supplier with annual sales of about $10.7 billion, based on 2017 results. For the last two years, Tenneco has been marketing an original equipment electronic suspension system through its Monroe brand. That product line goes with the spinoff. Kesseler notes that the intelligent suspension technology will allow Driv to play a growing role in the industry's electrification trends. "The intelligent suspension space is growing," he said. "Today, it has an installation rate of just 3 to 4 percent. The forecast is that by 2025, it will be at 15 percent." On the aftermarket side, where profit margins tend to be higher, he believes there will be big opportunities for growth in Europe and China. In China, the average age of vehicles is about 4.5 years, he noted. By 2025, it will have increased to 8.5 years on average. The opportunity for replacement parts will be all the more attractive because there is no do-it-yourself market in China. "China will very rapidly become the world's largest aftermarket," he said. The company's stable of brand names includes Monroe, Walker, Clevite, Moog, Fel-Pro, Wagner, Ferodo and Champion. Last month, even as it prepared for its spinoff, Spinco closed on an acquisition of another brand: the Swedish technology supplier Ohlins Racing. Ohlins is a producer of premium suspension systems and components and has aided Tenneco in suspension development for the last 20 years, Kesseler said. He said Ohlins will bring a culture of advanced technology to the newly formed company.